DOYLESTOWN, Pa. (WPVI) -- Authorities are asking for the public's help in tracking down a serial bank bandit caught on camera Tuesday morning robbing a bank in Bucks County. The holdup happened at 11:26 a.m. Tuesday at a Wells Fargo Bank branch in Doylestown. Police say the suspect walked into the branch, presented a demand note and suggested he had a weapon. He fled on foot with an undisclosed amount of cash. He was last seen heading east on West Court Street. Police describe the suspect as a black male, 6'2" to 6'4" tall, 270-330 lbs. with a stocky build. 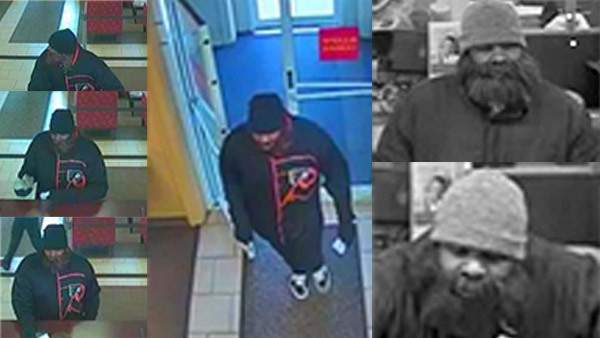 He was wearing a fake brown beard and a black jacket with a Philadelphia Flyers logo on the left side. Investigators say the same suspect is believed to have committed other bank robberies in Lower Bucks County. Anyone with information about the suspect or case is asked to contact Central Bucks Detective Sgt. Paul Kreuter at 215-345-4143.